Sécheron’s TMS voltage sensor complies with EN50463 standard and provide accurate output signals for energy measurement and vehicle protection functions. Optional output offset for safety critical applications. Sécheron TMS is a versatile Traction Measurement System for rail vehicles. It provides signals that can be used for voltage detection, traction control and protection, and energy measurement functions. The current product configuration ensures voltage measurement for 15 kVAC and 25 kVAC traction system supply voltages. It transmits safe, isolated, and accurate signals to a variety of on-board equipment. The TMS is available on a stand-alone basis so that car builders and operators can install it on the vehicle roof. It can also be integrated into our smart, compact MODBOX® high-voltage enclosure with other high- and low-voltage functions for the electrical safety, measurement and control of the traction chain. 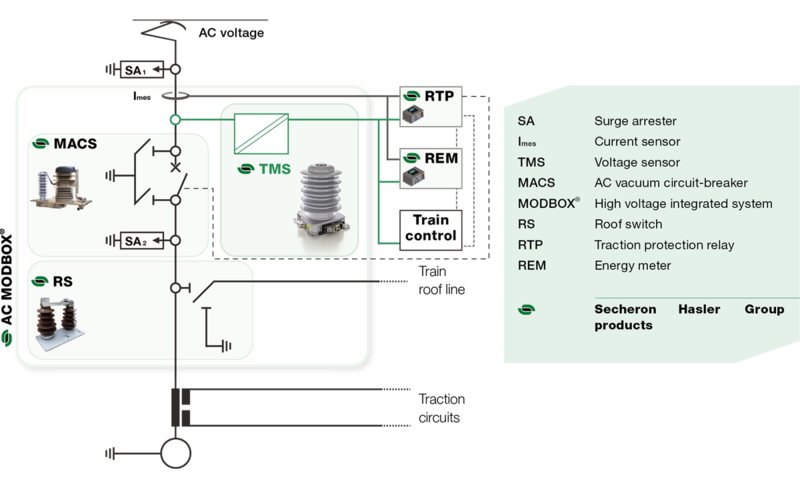 If you are looking for a more comprehensive solution, the TMS can also be delivered as part of the Sécheron Hasler Energy Metering System with REM102 energy meter including the Energy Calculation Function (ECF) and the Data Handling System (DHS). Maximum permanent measured voltage 31.5 kV. Maximum peak measured voltage 50 kV. Impulse withstand voltage 170 kV. 3 isolated analog outputs, current loop type. Bipolar or Offset type outputs. Bipolar output: DC offset = 0 mA; AC gain = 1.0 mA/kV. Offset output : DC offset = 30 mA; AC gain = 0.4 mA/kV. Measuring resistance: 10 to 200 Ohms. Height: 385 mm – Weight: 17 kg. Certified according to standards: EN 50463-2 / IEC 62888-2.